The Sound of Music opened on Broadway 50 years ago tonight. 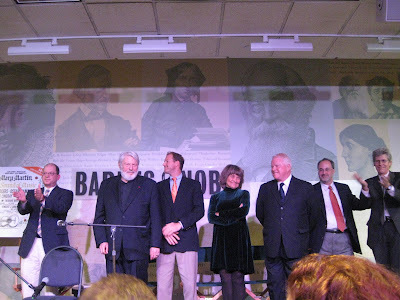 Celebrating at the Barnes and Noble Lincoln Triangle were members of the original cast, replacement cast, Anna Crouse, widow of bookwriter Russell Crowse, Richard Rodgers' daughter Mary Rodgers, representives from the Rodgers and Hammerstein Foundation, authors of books about both the stage musical and the movie musical, and fans of the work. Opening the evening, Kate Baldwin thrilled the room when she sang the title song, The Sound of Music. Kate played Maria at St. Louis' Muny in 2005. Laurence Maslon, author of The Sound of Music Companion, served as the moderator for the evening. 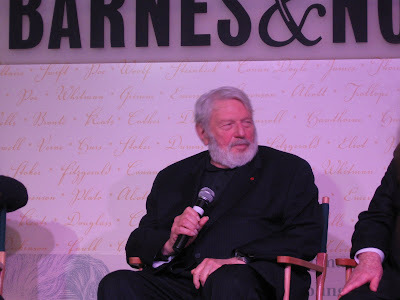 The first two guests were Sam von Trapp, grandson of Maria, and Bert Fink, author of a new children's pop up book about The Sound of Music. Sam is the president of the Trapp Family Lodge in Vermont. Sam said that he saw the musical when he was around 6 years old, but his family sheltered them from it and he didn't see it again until his twenties. He also didn't realize the impact it had until he was traveling in South America and he was asked about his grandmother. He was 15 when Maria passed away. He recalled that Theodore Bikel, the original Captain von Trapp in the musical, called her "a tyrannical saint." Sam's father is Johannes, the youngest of Maria's children - and in a sense, the "Gretel." He said that the story - both the stage show and the movie - reflects the integrity of their family - willing to stand up for what was true and right. Next, Maslon talked with Laurie Peters, “Liesl” and Brian Davies, “Rolf”. They are in their late 60s now. Brian emphasized that he didn't realize the impact of the show until almost recently. Laurie talked about the Tony nomination that was bestowed upon her, "Laurie Peters and the von Trapp children." She confessed that she didn't know what the Tony Award was! Brian shared the story of the set for scene "16 going on 17" - there was a large, beautiful set built for the scene and they learned the dance around it. But when they got to New Haven for their out of town tryout, the set wouldn't fit in the theatre, so they had to just use a bench. The director liked it so much that they just kept the bench. He also told of the night when he accidentally pushed his bicycle into the orchestra pit. Much to his chagrin, he was called back to to Miss (Mary) Martin's dressing room...but she only want to make him feel better and did by telling him about the night that she was over exhuberant in her cartwheels during South Pacific and cartwheeled right into the pit herself. Laurie and Brian both emphasized that Mary Martin was the leader of the pack and set the professional tone of the company. She was very warm, funny and kind, but the work and the audience mattered the most. Laurie said Mary was devoted to the children, but it wasn't a sachrine devotion at all, it was real and wise. his one man show, Sholom Aleichem: Laughter Through Tears, at Baruch. He himself is an immigrant from Austria - a refugee. He said the difference between his departure from Austria and that of the real Captain's was that the Captain made the choice, but he himself had no choice. When he auditioned, he already had a career as a folk musician. He took his guitar with him, and although he did sing some Broadway type tunes, he also sang a folk song. He said that, "Mary tapped Rodgers on the shoulder and said, 'we don't have to look much further do we'". Eidelweiss wasn't originally written in the score. He said that Rodgers and Hammerstein sat down at the piano in the theatre and wrote a "genuine, old Austrian folk song". The last word - "forever" - turned out to be the last word that Oscar Hammerstein wrote (he passed away August 23, 1960). Ending the evening, Theodore Bikel sang and played Eidelweiss for us. It was truly a breathtaking and unforgettable moment. 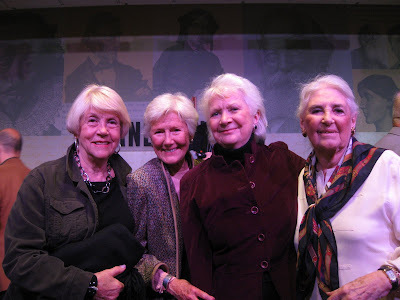 My favorite story of the evening came from four of the original "nuns" (at least two were Bernice Saunders, who was also a nurse in South Pacific, and Mimi Vondra - feel free to comment and let me know the other two names!) They shared a long bowling alley like dressing room. They were divided into two groups, the more classically trained group and they, the musical comedy club. They would play poker in their dressing room. They also said that Patricia Neway, the Mother Abbess and the winner of the Tony for Best Featured actress, usually had a poker game going in her dressing room too. Sounds like a great time! And hey, poker playing nuns? What could be more fun? I would have loved it had the "Musical Comedy Club" been interviewed. Being backstage, and observing as much as they did I'm sure their memories are just as vivid and interesting as those from whom we did hear. Great, great ladies!! Thank you for iterating this marvelous reminiscence to us.The film version of "The Sound of Music" is my reason for being acquainted with musicals, and that preceded my avid adoration of opera. Do you know anything about Andrew Lloyd Webber's new production of "The Sound of Music, and are you anxious to see it? BBC America had a show that decided who would play Maria in the mounting, and all of the contestants I saw from the commercials for it were belters; it may as well have been "American Idol" for musicals. I ave also heard that Webber is creating a sequel to "The Phantom of the Opera." Have you heard about this? From the limited amount of information I have heard from trusted sources concerning the plot, I do not think that it shall be very good, but if you have information to the contrary, I should like to hear it to make an informed decision. One of the other ladies is named Ceil Delli. I couldn't tell which one was which, save for Ms. Saunders. But still wondering if we'll get to round out the quartet! Kevin, I would adore spending time with these ladies? Wouldn't it be fun to invite them out? Perhaps they'll see at least one of our posts and respond! The more I think about them, the more questions I have about what it was like to be a golden age Gypsy and what it was like to observe so many great talents. Oh my goodness. And to hear all their anecdotes from the backstage area - "The Musical Comedy Club" indeed! !